I’ve been on a mission to read more books by Joanne Harris ever since I attended one of her events at the Buxton Festival. She’s a witty, wise woman and her literary range is incredible. Most famous for writing Chocolat, which was made into a film, Harris’s works include psychological thrillers, fantasy titles and cook books. 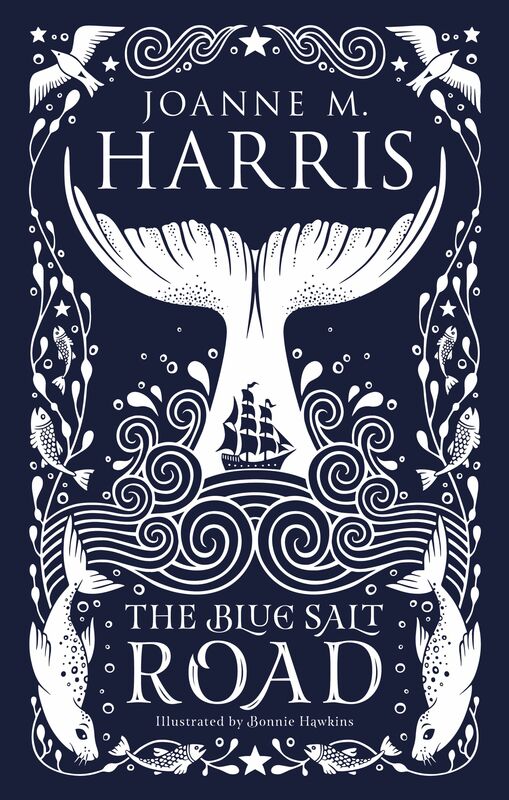 The Blue Salt Road is her latest mythological publication and I was lucky enough to win a signed hardback copy of this beautiful novella after entering an Instagram giveaway hosted by @_the_book_bug_. But before I even read a word, I was entranced by the artwork. Sue Gent’s cover is absolutely spectacular (the white above is actually silver foil). The page illustrations by Bonnie Helen Hawkins are equally as beautiful. This is definitely one you’ll want to own. The story is based on the Child Ballads, 305 traditional ballads from England and Scotland, which were anthologized by Francis James Child during the second half of the 19th century. 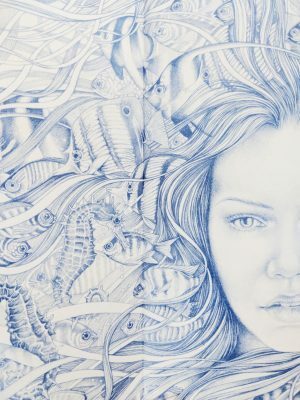 I’ve been fascinated by selkies for a long time, but all the stories I’ve read have focused upon entrapped females so it was refreshing that this is to from the point of view of an imprisoned male. All the tropes are turned in this compact tale. The man becomes the unwitting victim. The woman, fuelled by a desire to survive, takes control, but in doing so steals her partner’s very essence. She also subjects him to terrible torments which Harris describes in lyrical detail. He must eat his own kind and hunt his fellow creatures. The selkie, having lost his memory, cannot quite remember why he finds these acts so horrific, but he feels intense repulsion when he is forced to do so – as do we. Considering the brevity of the ballad, Harris manages to weave a rich tapestry around the original verse. The characters and plot follow a traditional structure though. This is told in the style of a folk tale so although there are complexities, the overall effect is one of simplicity. This isn’t a modern-day telling either. The action is set in an impoverished 1700s coastal settlement, which goes some way to explaining why the human characters act as they do. They need security, nourishment and warmth above all else and will do almost anything to protect their families. When a story is as brutal as this, you expect a bittersweet ending and Harris doesn’t disappoint. She maintains the balance between good and bad, hope and regret right through to the conclusion. This ambivalence is a strength of The Blue Salt Road. Both sides are flawed. The selkies are naive and complacent; the humans are greedy. They both have a lot to learn from one another if they are to live side by side. I’d recommend this for bibliophiles who enjoy mythology and folklore with a twist. I especially think it would be an amazing read for anyone visiting the Scottish Isles because it brings that world to life so well. Harris has a canny knack for unveiling the magic in this world. If you enjoyed this then see our other book reviews. Great review! I’ve read this author, but the books sound like a great read. It’s a skillful retelling. Definitely worth a read!